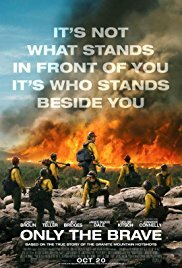 Only The Brave is a film about the heroes of the Granite Mountain Hotshots. Knowing that it was going to be a sad ending I still didn't plan to tear up in the theater. Cast: Josh Brolin, Miles Teller, James Badge Dale, Taylor Kitsch, Geoff Stults, Alex Russell, Thad LuckinBill, Ben Hardy, Scott Haze, Jake Picking, Scott Foxx, Dylan Kenin, Ryan Michael Busch, Kenneth Miller, Ryan Jason Cook, Brandon Bunch, Matthew Van Wettering, Michael L. Mcnulty, Nicholas Jenks, Sam Quinn, Jeff Bridges, and Jennifer Connelly. Pros: I don't know very much about the facts of the events leading to the heroes that fell but I am sure the movie did it justice. I loved the actors and how well they brought out each person they were portraying. They sucked me into the lives of those fallen and I was amazed of the great chemistry they had. Only The Brave worked in timelines to make you invested in each character and it was well done. Cons: The only con I can think of is maybe the movie could have of been a little longer to squeeze in more hotshots that weren't in the spotlight. Take the family or even a date and enjoy this drama of actual events about those who battle fires to save our forests and, more important, our communities. Be prepared for a heart-wrenching ending and take a few tissues because Only The Brave is a tear-jerker. If you don't end up seeing it on the big screen this will be a must to own when it's released.